A four star hotel, with 51 modernly furnished rooms, in a central and quite location, ideal for business, tourist groups and individuals. All outlets are furnished to satisfy all of our customers needs, such as an Outside Swimming Pool, N.E.W.S. Restaurant , Pizza Vino Bar, Platine Night Club, Free Wireless Internet in Lobby , Meeting Rooms, Wedding Arrangement, Free Parking, Hair Dresser (Upon Request), Airport Pickup (upon Request), Rent-A-Car office (Openning Soon). In a relaxing atmosphere, you can enjoy breakfast, lunch and dinner while listening to soft music, serving European, Oriental dishes and home made sweets. 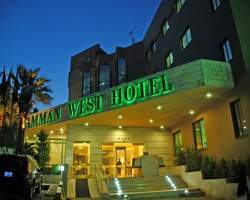 Weddings, Engagement Parties, Birthday Parties, Receptions, Business Meetings, Conferences, Private Gatherings etc., are all catered for at Amman West Hotel. Whether at N.E.W.S. Restaurant (220 pax), Swimming Pool (250 pax) and The Meeting Room (100 pax), with all the right arrangements, and the meeting fascilities. From the moment you enter our reception, you will feel wellcomed by Amman West Hotel well-trained staff, who will spare no effort in making your stay in Jordan a memorable one. Reception parties and Galleries are catered-for at West Hotel reception lobby. Free Wireless internet is available at the Lobby , Restaurant , Meeting Room and the Swimming Pool. Also available free use of West Hotel Dest-Top computers loacted in the lobby. Free parking is available at Hotel site , with 24 hours security. Valet Parking is provided at Meetings and Weddings. Palm trees and greenery surrounding Amman West Hotel private and relaxing swimming pool, serviced with all kinds of dishes, snacks, drinks and sandwiches.